The Indian Ocean Rim Association for Regional Cooperation was formally established in 1997 under the leadership of South Africa, India and Australia. The demise of Apartheid, the fall of the Soviet empire, and the rapid advance of globalization altered the geopolitics of the Indian Ocean region in the early 1990s and served as a catalyst in the creation of the IOR. 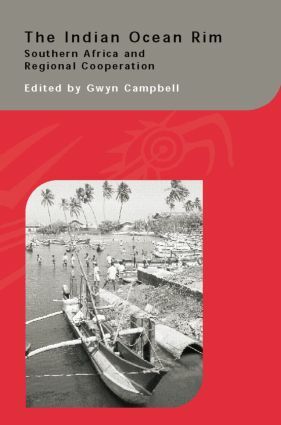 This book contextualizes the founding of the IOR by outlining the historical aspects of economic ties across the Indian Ocean and previous attempts to promote regional cooperation. The contributors to this volume analyse the post-colonial ideological legacy, the political and economic constraints caused by Apartheid and communism, the end of protectionism and the problem of globalization. These major themes in the history of the IOR are applied to what the future holds for Southern Africa within this economic grouping, and whether or not regional cooperation will manage to compete with globalization. This volume will be of interest to scholars of development studies, international relations, Third World studies, and regional development. Gwyn Campbell served as an academic adviser to the South African government in negotiations that led to the formation of the IOR. He is a Lecturer at the Centre for North-South Interaction at the University of Avignon. He has published widely on the economic history of Madagascar and the south west Indian Ocean including Economic History of Imperial Madagascar 1750-1850 (Lit Verlag: 2002).